When reviewing the market research approaches and techniques being used or considered we need to keep in mind that the GRIT sample tends to be drawn from people more interested in change and new approaches. This means the data should not be taken as being an audit of the whole research industry; rather the data are an indication of change and rate of change. This past summer, we at Forrester continued to explore new and innovative methodologies. One of my highlights was visiting the IIeX conference in Atlanta back in June. And although I was impressed by the variety of new (qualitative) methodologies, it’s rarely a matter of choosing one or the other. The recent GRIT report by GreenBook shows, for example, that many market research online community (MROC) vendors dropped a few places in terms of innovation, but I agree with Andrew Leary from Ipsos SMX that these online communities will continue to play a relevant (and innovative!) role thanks to their flexibility and variability when it comes to size, duration, integration, and scale. Well if you don’t know who is James Gaskin and you work with structural equations models with SPSS AMOS, you have definitely missed something! This guy is simply awesome and i love his work ! James holds a youtube channel wich he updates frequently about this topic. He offers for example Bootcamps (accelerated training sessions), and many recordings of his interventions on the subject for free! you can also find datasets to work with and enhance your usage of this method! He also proposes a bunch ofsmart and handy plugins you can use to make your work easier with SPSS Amos! For example drawing your model directly from the SPSS PCA output! this is really a very cool work that deserves to be praised and encouraged! What should be the top 3 priorities for people working in analytics for marketing? Attribution, Attribution, Attribution. Without attribution, what’s the point of measuring anything? You might be able to say traffic is up, or traffic is down, but you won’t have the slightest idea why, or what to do to change it. But attribution isn’t easy, it takes a lot of knowledge and some clever tech to get it right. 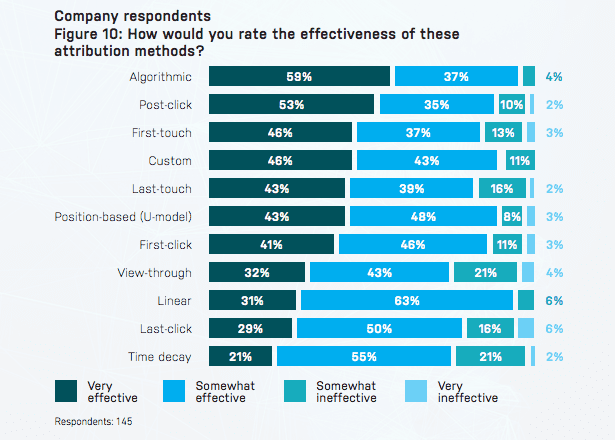 For those looking at improving their existing attribution methods, it is helpful to know what top marketers find the most effective way of achieving accurate attribution. A new report from AdRoll can go some way to providing the answers. By asking a mix of client-side marketing professionals and agency marketers (75% in-company, 25 % agency) in the UK, France, and Germany, they discovered what types of attribution marketers found the most effective. Algorithmic came top of the pack, with a whopping 96% of marketers reporting that it is very or somewhat effective. Human Attention Span Shortens To 8 Seconds Due To Digital Technology! In the digital age, where the news is limited to 140 characters and conversations take place in the form of emojis, our attention span has shortened. A recent study by Microsoft Corporation has found this digital lifestyle has made it difficult for us to stay focused, with the human attention span shortening from 12 seconds to eight seconds in more than a decade. The rise of gadget use in the 21st century means our lives have become increasingly more digital at home, work, and school. In the U.S., nearly two-thirds of Americans are smartphone owners, with many users utilizing their phones for online access, according to a recent Pew Research Center poll. More than half of these smartphone users admit to using their phone in the past year to look up information about a health condition, but at what cost? In the 54-page study, Microsoft sought to understand what impact technology and today’s digital lives are having on attention spans. The researchers collected data from surveys of more than 2,000 Canadians over the age of 18, who played games online to determine the impact of pocket-sized devices and the increased availability of digital media and information are having on everyday life. The researchers also monitored over 100 people’s brain activity with in-lab monitoring, using electroencephalograms (EEGs). For the survey component, the researchers sought to gauge overall attention and gauge habits and perceptions by dividing the respondents into three equal sized groups based on performance — low, medium, and high attention — representing one-third of the sample. For the neurological component, participants’ brain activity was recorded and behavior was filmed while they interacted with different media and performed several activities across devices and in different environments. EEGs were used to measure their attention levels and activities were mapped against tasks and behaviors to view how attention varied by screen, task, content type, and structure. Today, I saw that pipeline is the #1 thing your business should be looking at if you’re in B2B. I can’t say I disagree with this, but I do really think it’s less about one metric like pipeline and more about what metric matters for when you’re measuring. 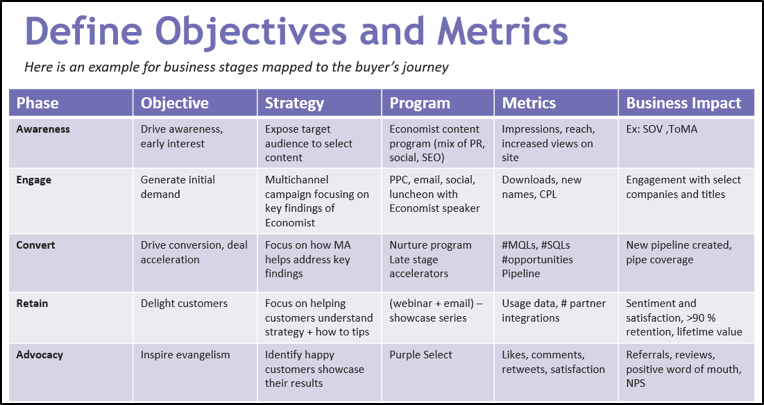 Be clear on your business objectives first, then determine what metrics to measure. One way to do this is by mapping your business stages to the customer journey. In the example below, the customer journey is broken into stages, including: awareness, engage, convert, retain, and advocacy, but they may differ for your organization depending on your business model. These stages represent the different business outcomes your company is driving towards (e.g. retention or share of voice), and it’s critical to establish this first to determine the right set of metrics and timing that map to those objectives. Thriving in today’s complex and ever-changing environment means companies need to gain rapid insights and translate those insights into actions. View this webinar to discover why predictive analytics has become an imperative for organizations as they strive to incorporate data-driven decision making into their processes by understanding potential future outcomes. Prescriptive analytics can then be applied to help determine the best solution or outcome among all the various choices, given the known parameters. When combined with predictive analytics, prescriptive analytics can suggest decision options for how to take advantage of future opportunities or mitigate future risks—and answering the eternal question: What should we do about this? Your job looks nothing like it did five years ago — even one year ago. Yet despite this permanent state of change, you are, more than ever, accountable for knowing exactly what’s happening across your organization’s eclectic mix of marketing activations at all times. So you’d have no problem explaining how your campaigns are performing right now, today. Right? It’s a simple question, but for most, it’s incredibly difficult — if not impossible — to answer. Mastering measurement has always been hard and, for many, even aspirational. As measurement vectors and approaches become increasingly diverse and sophisticated, many marketers are more than a little overwhelmed.